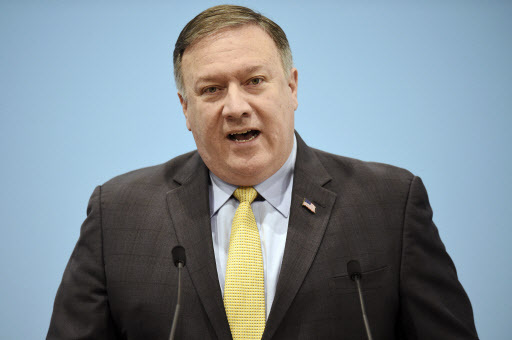 Speaking on the sidelines of an annual ASEAN Regional Forum in Singapore, Pompeo told reporters that the US had credible reports that Russia was violating UN sanctions by allowing joint ventures with North Korean companies and issuing new permits for North Korean guest workers. His remarks came amid recent news reports that indicate Pyongyang is continuing to build intercontinental ballistic missiles and the enforcement of sanctions on the North is being relaxed. A day earlier, the Trump administration imposed sanctions on a North Korean bank executive, a North Korean company, a Chinese company and a Russian bank it said helped the North Korea regime facilitate illicit financial activity. It asked the UN Security council to add them to the UN sanctions blacklist. A UN report on Friday showed that North Korea had resorted to a “massive increase” of illegal ship-to-ship transfers of oil products at sea to evade sanctions, according to news reports. The 62-page report also listed violations of a ban on North Korean exports including coal, iron and seafood that generate millions of dollars in revenue for the reclusive regime. After North Korea committed to the complete denuclearization of the Korean Peninsula at its historic summit with the US in June, China and Russia have called for the sanctions to be eased. But Pompeo emphasized the importance of maintaining pressure on the reclusive country to achieve the goal of the “final, fully verifiable denuclearization” of North Korea amid slow progress on disarmament. “It is clear, our partners and allies within ASEAN know how important the denuclearization of North Korea is for their own security. I called on them to strictly enforce all sanctions, including the complete shutdown of illegal ship-to-ship transfers of petroleum destined for North Korea,” he said. However, Pompeo said he had remained optimistic about North Korean leader Kim Jong-un‘s commitment to denuclearization. “We are determined to do it, Chairman Kim is committed to doing it and I am optimistic that we will get this done in the timeline,“ he said. North Korean Foreign Minister Yong-ho is also in Singapore for the ARF, fueling speculations that Ri will meet with Pompeo on the sidelines. Pompeo said he was yet to meet with him during the gathering. Earlier in the day, Pompeo had a bilateral meeting with South Korean Foreign Minister Kang Kyung-wha on the margins of the ARF. They exchanged views on the latest developments on the Korean Peninsula and vowed close coordination to resolve the North Korean nuclear standoff, according to Seoul’s Foreign Ministry. The top diplomats of the two Koreas and the US will all encounter each other again at a meeting of foreign ministers from 26 countries and the European Union later in the day. A joint statement hailing recent peace efforts on the Korean Peninsula and urging a stronger commitment to denuclearization is expected to be adopted. Led by the 10 members of the Association of Southeast Asian Nations, the ASEAN Regional Forum kicked off Thursday, bringing together key countries in the Korean Peninsula’s denuclearization efforts. It is one of the largest gatherings in the region to discuss security issues in the Asia-Pacific region. In recent years it has served as a rare venue for North Korea to interact with other countries.